Curtis Cross (b. 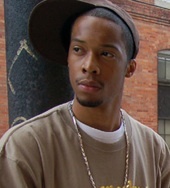 1983) (better known as Black Milk) is a hip hop producer and MC from Detroit, Michigan. He began his music career producing beats for Slum Village. In 2004, he formed BR Gunna, with Young RJ, and Fat Ray, and together they released Dirty District: Vol. 2, a follow up to a compilation released in 2001 by Slum Village in which he contributed production to also. Black Milk then released a solo album, called Sound of the City, Vol. 1, the following year and in 2006 he signed a record contract with Fat Beats Records. In the fall of 2006, he released an EP, entitled Broken Wax. 2007 saw the release of his second album, Popular Demand, on March 13, 2007.